This story is one of my favorites. Lovecraft does what he does best in At the Mountains of Madness; he tells us a story through tantalizing second-hand hints and messages sent by wire, by footprints and glyphs and traces of mayhem, of things at first fearsome and strange, but increasingly deserving of our sympathy. A story of the Old Ones who built a nigh-endless city and whose civilization spanned ages. And our own place in the story and the cosmos which . . . but you’ll see. Cozy up in a warm spot and make the journey to Antarctica where you may discover a world of which our world is only a part. A world full of that which will make men mad if they should look upon it. 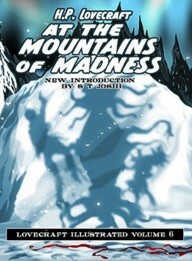 At the Mountains of Madness. By H.P. Lovecraft, illustrated by Pete Von Sholly, introduction by S.T. Joshi. Hornsea, England: PS Publishing; 2014; ISBN 978-1-848637-36-8; jacketed hardcover.